No matter who you are, chances are you have assets that require shelter. Whether it's a shed for your tools or commercial sheds used to house business workshops, Garage World is dedicated to providing you with custom designed buildings that will suit your specific needs. There's no shortage of builders available, but at GarageWorld, we set ourselves apart by focusing on building strong and building right. From residential garages to large commercial sheds, Garage World is here to provide you with quality work at an affordable price. 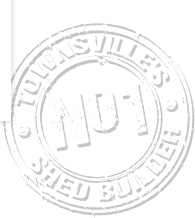 Contact Garage World Townsville today to see design examples or apply online now for a free shed or garage quote.